Thursday April 28th 1921 I put in forenoon fixing my machine and getting my front bed-room ready to sew in. Hattie washing silk things. Emma came at noon. Hattie & Fannie to town. Cora helping sew. I was very tired and slept awhile. Wrote Lydia. Friday April 29th 1921 I went to town to do some errands. Went up to Wills grave. Mrs Horenscheck came back on the car with me. I went up in Otts office and ride home with them. Hattie went with Fannie in afternoon to call at The Kirkwood home because she is dead. 99 years. I slept two hours and after supper we all dressed to go to "Robin Hood" Ott & Fannie went with us. It was a fine comic opera. 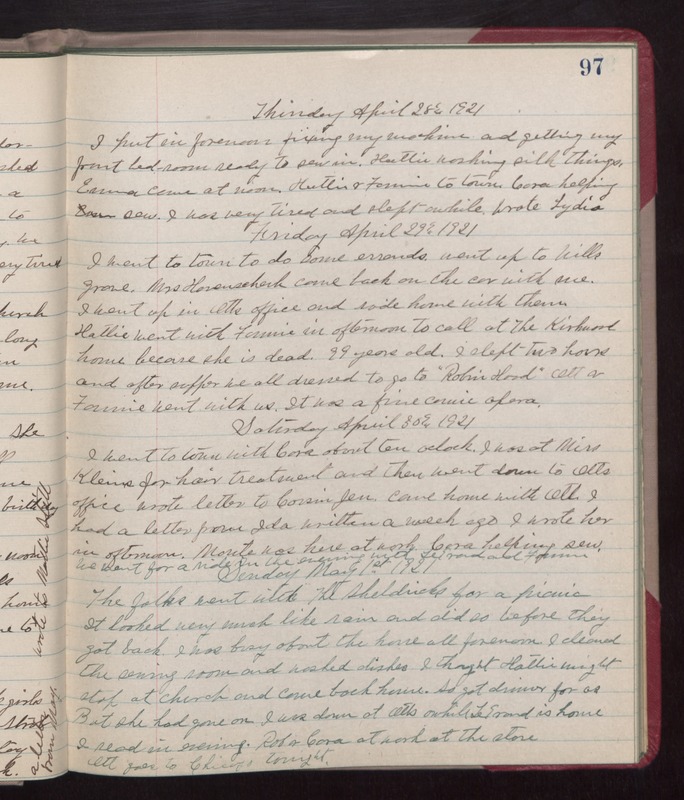 Saturday April 30th 1921 I went to town with Cora about ten oclock. I was at Miss Kleins for hair treatment and then went down to Otts office. wrote letter to Cousin Jen. Came home with Ott. I had a letter from Ida written a week ago. I wrote her in afternoon. Monte was here at work. Cora helping sew. We went for a ride in the evening with LeGrand and Fannie. Sunday May 1st 1921 The folks went with The Sheldricks for a picnic. It looked very much like rain and did so before they got back. I was busy about the house all forenoon. I cleaned the sewing room and washed dishes. I thought Hattie might stop at church and come back home so got dinner for us But she had gone on. I was down at Otts awhile. LeGrand is home. I read in evening. Rob & Cora at work at the store. Ott goes to Chicago tonight.